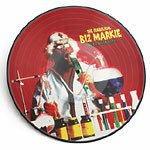 For Black Friday Record Store Day Biz Markie's landmark release is available as a deluxe, limited edition picture disc. Also included, a musical postcard that plays the Biz's ultimate hit, ''Just A Friend'' on any turntable! Man it sounds so nice remastered! The vibes are still flowing strong out of this record. The message is too! Don't do drugs, spit crazy rhymes and love women! The picture disk and flexi disc are so sick too.